Since I’ve been registered to vote I have been a registered Republican but I am going to be changing that, hopefully in time to vote Democratic in the next election. So why am I switching sides and voting Democratic if I am so pessimistic about both political parties? The answer is simple: I am convinced that if the Republican party comes to power again they will undo decades of civil rights and civil liberty progress, their economic policies will further ruin the U.S. economy, and their platform is based on hatred and fear has only worked by appealing to the ignorant and inconsistent Religious Right. Whatever the problems of the Democratic party, they are certainly less than this. 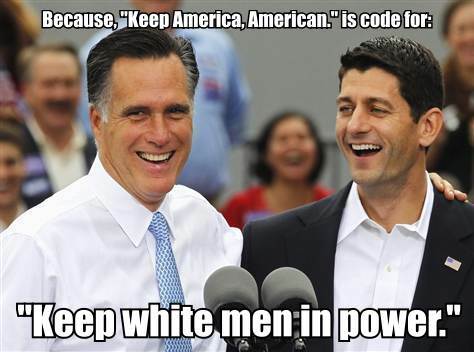 First, in regards to civil rights Romney/Ryan are rich white privileged heterosexual Christian males. This demographic is the person of reference, or the idealized person, in the dominant U.S./Western culture. They are their constituency and to think that they have the best interests of anyone else in mind is naive. They are not for social progress but for the continued privileging, enshrining and protection of people like them. This is directly contradictory of the progress of liberty, common dignity and equal protection and rights for all U.S. citizens, even those who are not rich white privileged heterosexual Christian males. An example of this is that Romney has openly declared that he wants to ban gay marriage and any sort of civil union and the ability of homosexuals to adopt children. Whatever you think of gay marriage, to deny U.S. citizens the right to be legally attached to their life partner of choice is ridiculous. In the pluralistic democracy that is supposedly leading the world in regards to freedom and civil liberty, how is this even tolerated at this stage? Second, the economic policies of the Romney/Ryan ticket do not work. Trickle-down economics is a failed policy. Since the 1970’s production in the U.S. rose roughly 80% but the average worker’s wage only rose 5%. The money companies were making did not trickle down but became more and more concentrated in the hands of increasingly few Americans. These wealthy American individuals and international companies now have billions of dollars to influence U.S. politics and they have done so to further increase their profits, often times at great cost to the American public and people in other countries. This entire situation is what is destroying the middle-class (contra the Republican claim that this has happened because people have become lazy as they have become dependent on Welfare). This entire situation has essentially disenfranchised everyone as it directly undercuts the basic tenants of democracy. Do we really believe a poor single mother has the same political power as a billionaire? It is part of the reason we are in this mess and even addicts know that to try the same thing over and over again expecting a different result is the definition of insanity. Romney/Ryan economics would continue this failed economic agenda and pursues the traditional economic agenda and ideology of the Republican party. It cuts social spending that would help the poor, it increases taxes on the poor, it decreases taxes on the rich, it cuts spending on education and the like while increasing our debt and increasing our already outrageous spending on defense. The greatest evidence against the the Romney/Ryan economic plan for helping the U.S.A is that it is currently being implemented in other places, such as Ireland, with grave consequences and no economic growth. Third, the Republican party has been for the last several decades run on a platform of hatred and fear and appealing to the ignorance and inconsistency of the Religious Right. The Religious Right and Fundamentalist Christians especially have envisioned real or imagined enemies that want to physically attack America and secularize this one “Christian Nation.” The Republican party has happily encouraged this fear-based mindset and promised to protect American from both physical attack and secularizing enemies. By saying the right things (“I am against gay marriage.” “I am against abortion.” “I am against other religions.” “I am against illegal immigration.” “I am against our enemies.” etc. and “I will protect you from these things.”) the Republican party have assured themselves the vote of a large number of ignorant and inconsistent religious persons. I say this because the Republican party is styling themselves as the protectors of freedom, but are staying in power by hoping to impose religious laws of Christians on all people. I say this because while Romney and Ryan claim to be Christian, their economic policies directly hurt the poor, people who Jesus clearly taught we should help. I say this because the Republican Party is against abortion, which appeals to many Christians, but is also pro-war and pro-capital punishment. This, to me, is a wildly inconsistent stance and not one that is based on Christian teaching. I say this because being a soldier is seen as a patriotic and brave thing to do…unless your gay. I say this because relying on the, “If you just work hard you will make money. Don’t be jealous of the rich. Why are you punishing those that are successful?” logic for defending the rich only really works if the playing field is level, which it is totally not. I say this because all of this has been pointed out time and time again, and is easily accessible to any Christian who wants to, but many Christians continue endorsing the Republican party and believe it is the only right and Christian thing to do. Republicans want every American to hate and fear other Americans, other political parties, and other ethnic and national groups. They want this because they have stayed in power by promising to protect us from these evil boogeymen that they themselves have conjured up, either through their sowing of fear or through their very real foreign policy which has made us many enemies. This reliance upon hatred has only become more and more blatant in recent years, to the point where this man was actually running for President and people who spend millions on research realized that his words would actually resonate with many Americans. So while I am by no means a fan of either political party, nor do I idealize Obama, I think we’ll survive a little longer and progress a little further without Republicans in power. This entry was posted in Personal Commentary, Politics and tagged Democracy, economic depression, economics, Republican. Bookmark the permalink. I don’t know Kevin, it seems to me we could use a drastic change from Obama’s so called plan of Hope and Change…. I loved living life with you in Modesto, but as time went by I realized things there were becoming progressively worse because the spending on entitlements had become extremely out of hand. There must be reform in those areas or very soon this entire country will be completely beyond repair. There has to be some incentive to get people off of welfare and disability to get them to want to work again. Reform is necessary to our welfare system certainly. Reform is needed in lots of areas in the U.S. government. However, the fact that the system is not perfect does not mean it is a failed policy and we need to stop all social programs. While I agree that some have become dependent on the welfare system, this is a sad choice that some make or some find themselves in after generations of poverty. Developing areas blighted with poverty is a better policy than bland hand outs, but I would rather people life off the state than die of hunger.